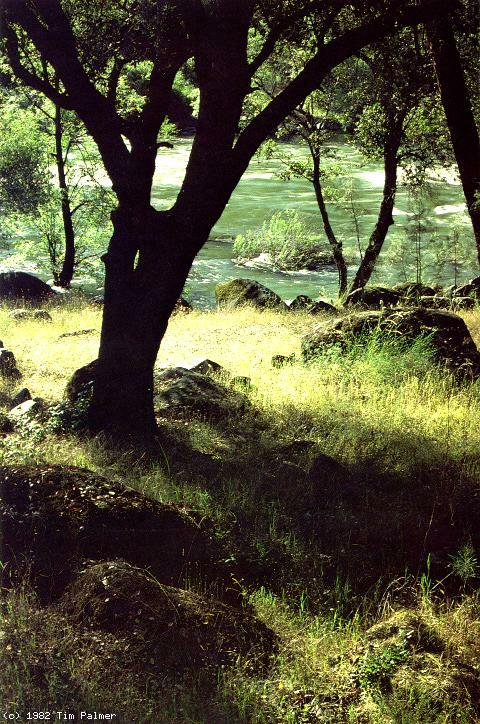 Formerly called the upper Stanislaus, now the drowned Camp-9 run, at one time this was acknowledged as the best intermediate run in California. People who knew the river before it was inundated by New Melones reservoir might feel overly depressed seeing it again, but for the rest of us, this run is well worth doing after a string of drought years. Many of the class II and class III rapids are totally unique, and beautiful limestone cliffs and forested hillsides are visible above the reservoir's bathtub ring. Although the length is only 9 miles, it goes slowly, so allocate an entire day. Camping is possible on the reservoir at Glory Hole (seldom crowded) and at certain undeveloped spots along the road to put-in. However note that this river is only a few hours away from population centers. The Stanislaus canyon is one of the few limestone areas in California, which implies that there are many caves around. A tourist visit to nearby Moaning Caves makes an interesting side-trip. Put in downstream from the powerhouse and wooden check dam, probably on the right bank. An old bridge across the river offers a bit of shade. On the hillside above is an old flume that brought water to miners. The trip starts with a long pool, giving you time to warm up. Cadillac Charlie, class II, a left turn against the right bank. Rock Garden, class II+, a long slalom among rocks and boulders ending with some big waves. This rapid was created by bridge construction debris, and did not look the same in the old days. Originally named because rowboats had to pull like a “big dog” to avoid shore. Later (re)named after a brand of shorts that got stuck on a snag, pulling a raft guide away from her boat and crew, who ran the rapid successfully without her. You should scout this from the bridge when you do the shuttle. This steep rapid ends with several big holes, and sharp entrapment rocks might lurk on the right. Suspension Bridge, class II+, contains some diagonal waves that can easily flip small boats if you approach them sideways. Angle right. Kind of like the Rock Garden, but bigger. The rapid is named after a large undercut boulder on the bottom right. Some routes avoid this undercut. In the olden days when this rapid was named, nobody actually died at Death Rock. 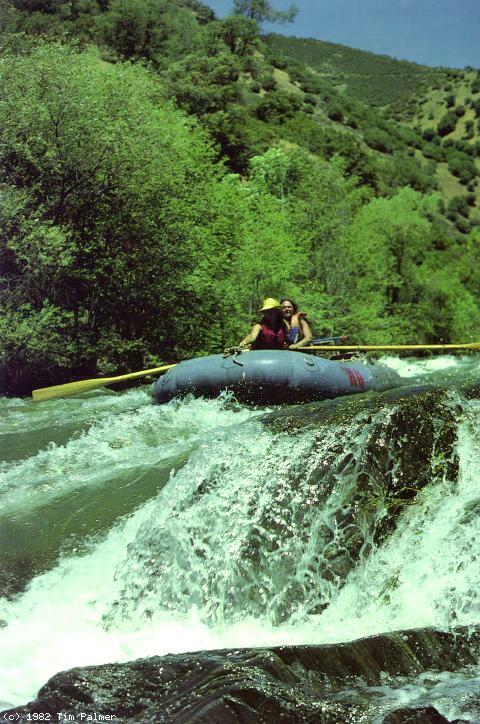 During the drought of the 1980s however, a private raft flipped running Big Dog above 5000 cfs, and one rafter (who had refused to wear a wetsuit) was swept downstream (last seen with his feet upstream, probably owing to hypothermia) .3 mile into the undercut, where he drowned. Formerly, at low water rafts had to hug the left wall, pull hard right and shoot thru a narrow slot (boats had to be nearly 90° to the current or they could wrap), then float towards the center and move left just above Death Rock. At high water a simpler route on the right, thru a nice hole, became available. Devil's Staircase, class II+, a series of sharp drops among rocks in a small channel. Some of the narrow chutes, especially ones too narrow for a raft, are lots of fun in a kayak. A rock was located to the left of the photo (river right) and rafts had to drop down between that and the rock shown in the foreground of the photo. Photograph scanned from Tim Palmer's excellent book about the New Melones saga and the founding of Friends of the River, Stanislaus, The Struggle for a River, published by the University of California Press. Photograph by Tim Palmer. When flows are low, the boulder bar entrance is very skinny and route finding becomes difficult; try the right. Below the boulder bar drop, the current funnels against bedrock into a large hole. Stay away from the right wall, which could bruise your elbow, and which in the olden days caused the demise of many a fiberglass kayak. Two large rocks diagonally guard the right. The most fun route is between the rocks, behind the first and in front of the second. A rockier but more straightforward route is available on far left, except at very low flows. Many kayaks flip here. Rose Creek enters on the left, in the midst of an extended and enjoyable class II slalom among big rocks. Good lunch stop and side hike, although in the old days, crowds here were so huge that everybody agreed to lunch elsewhere. Good rapids continue immediately below. Wool Hollow creek enters on the right. 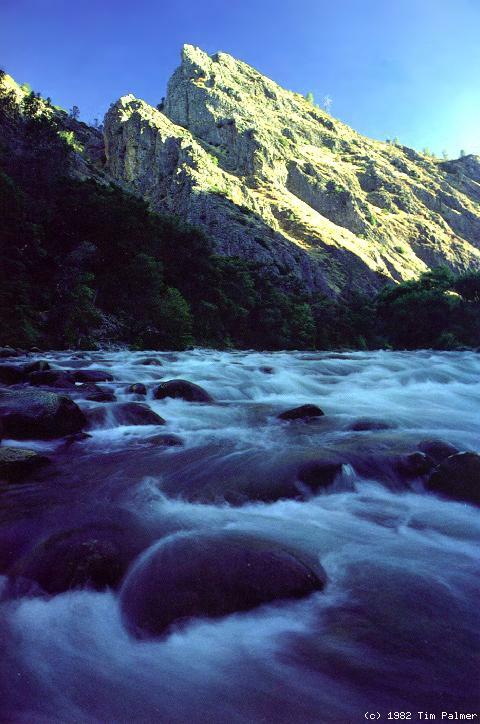 The limestone peak upstream is one of the most scenic along the Stanislaus. In the old days, blasting operations at a nearby quarry often petrified boaters. There was a fine rope swing at the base of the cliff. Mother Rapid, class II, a boulder bar with rock on the left below. Razorback Rapid, class II, against a cliff on the left of upturned limestone containing marble veins (actually silicic sponges) that often punctured incorrectly maneuvered rafts. Deadman's, class II, yet another stupid name, a long boulder bar leading towards, but at low flows not into, a tall cliff on the right. Crystal Cave high on the right bank makes an interesting side-hike. Be sure to take at least two flashlights into the cave, in case one runs out of batteries. Several narrow passages lead to a large central chamber. The cave was nicer before reservoir siltation. South Fork of the Stanislaus enters on the left. This river trip becomes worthwhile when the reservoir recedes to this level, about 900' elevation. In the miles ahead, marble quarry roads become visible on the left bank. Sierra Club Rapid, class II, named because Sierra Club rafters often wrapped on an undercut fin rock in the middle of the left channel. Usually there were a couple boats wrapped on top of each other until flows receded in summertime. This was the epitome of a wrap rock. Wino's Swim, class II, formerly a good place to practice swimming with feet up. Chinese Dog Leg, class II+ on the correct route, class III+ otherwise. This is one of the most unusual rapids anywhere, partly because it looks totally impossible until you discover the best route. Enter right of center and move all the way left, make a sharp right turn, and choose any exit route. The best ride was on a big wave train along the left bank. This rapid might have been named after Chinese gold miners who worked the area. A distance below this rapid was Manhattan Beach on the left, a hangout for locals where slow moving water had deposited a white sand beach. Chicken Falls, class III on the left (over the falls), class II on the right (chicken route). My informants warn me, “Don't run Chicken Falls naked on a log at 10000 cfs,” as if they had actually tried it. This falls is followed by another rapid just before take-out, where swiftwater continues for a distance. Parrott's Ferry Bridge. Take out on the left bank below, or on the bridge if the reservoir is high. We spent two unscheduled nights on the South Fork Stanislaus, without any food, dry clothing or anything except one space blanket, iodine tablets, and a lighter. We were expecting a 3-hour trip and it took 50!! I'd love to say we were fishin' and swappin' yarns and having us a grand 'ol time, but the fact of the matter is we were famished, weak as kittens, and covered in poison oak by the time a gold-hunting boat crew happened by and gave us a ride across New Melones reservoir. A most educational experience ... ever since then I've been acutely aware of subtleties like time of year, time of day, distance to take-out. The reason we went so slowly was that this was the first decent water year after many drought years, and after the first few miles, many trees had grown into the river bed. Some, naturally, had fallen down. The river was therefore fully into the trees, and there were strainers, so while it wasn't high in an absolutely sense, it was high and potentially dangerous considering the trees. I was a relatively new boater and didn't have the skills to boat blindly downstream under those conditions, so we had to basically scout every inch of the way. Because there were strainers and other obstacles we ended up dragging our boats a great deal: we would scout, return to the boats, then drag the boats downstream, covering the same ground three times. Eventually we left the boats and hiked the rest of the way. The run itself wasn't therefore inherently a poison oak fest, we just made it into one by scouting and dragging our boats through it.